Looking for some fun or useful apps for your Treo or Centro? 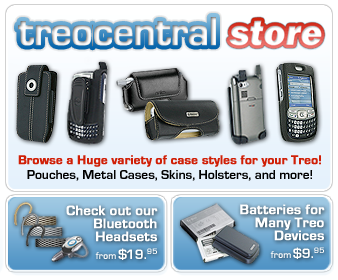 Sometimes I can get a pretty good idea of what's worthwhile to pick up by browsing through the best selling apps in the TreoCentral Store. There are so many apps to choose from for our Palm smartphones, and sometimes it's hard to narrow down the options. So I tend to see what's popular and what is selling the best. Chances are, if lots of other people like the app, I will too. I see that TouchLauncher is still the #1 best seller in the Palm OS apps. It was the #1 app back when I reviewed it last October too. TouchLauncher is a cool program for sure. The version I reviewed was 1.2, and I see that TouchLauncher has been updated to 2.2 now. Check out the video below about version 2.2, and you'll see why TouchLauncher is so popular. $6.99 is a great price too! So sift through the Top 10 Palm OS and WM/PPC apps below and see if you see something that catches your eye. TouchLauncher - a sleek new launcher for Palm OS. PalmaryClock Wireless for Treo and Centro - Look up weather around the world, convert currencies and more! TAKEphONE - Find/Call/Edit contacts fast & easy. No stylus (one hand) operation. Check out my TAKEphONE review here! Weather ( infinity subscription ) - Make your own weather station at Palm now! I reviewed Weather back when it was in BETA here! VolumeCare Pro - Bring your Treo or Centro alive with amazing MP3 ringtones - set personal tones and pictures for friends and groups. UltimatePhone - UltimatePhone is where your Treo experience begins and ends providing a gateway to web 2.0! Elecont Launcher for Pocket PC and Smartphone - Powerful touch friendly launcher with animated effects. If you didn't see something that you need or like there, no worries, because there's plenty more software to browse, be it games, utilities, medical software, music apps, photo apps, reference apps, or whatever. Don't just talk on your Palm smartphone, have fun with it and take advantage of all its cool abilities.